By the arrangements of the Canadian federation, the Canadian monarchy operates in Saskatchewan as the core of the province's Westminster-style parliamentary democracy; As such, the Crown within Saskatchewan's jurisdiction is referred to as the Crown in Right of Saskatchewan, her Majesty in Right of Saskatchewan, or The Queen in Right of Saskatchewan. The Constitution Act, 1867, however, leaves many royal duties in Saskatchewan specifically assigned to the sovereign's viceroy, the Lieutenant Governor of Saskatchewan, whose direct participation in governance is limited by the conventional stipulations of constitutional monarchy. The role of the Crown is both legal and practical; it functions in Saskatchewan in the same way it does in all of Canada's other provinces, being the centre of a constitutional construct in which the institutions of government acting under the sovereign's authority share the power of the whole. It is thus the foundation of the executive, legislative, and judicial branches of the province's government. The Canadian monarch—since 6 February 1952, Queen Elizabeth II—is represented and her duties carried out by the Lieutenant Governor of Saskatchewan, who's direct participation in governance is limited by the conventional stipulations of constitutional monarchy, with most related powers entrusted for exercise by the elected parliamentarians, the ministers of the Crown generally drawn from amongst them, and the judges and justices of the peace. The Crown today primarily functions as a guarantor of continuous and stable governance and a nonpartisan safeguard against the abuse of power. This arrangement began with the granting of Royal Assent to the 1905 Saskatchewan Act, and continued an unbroken line of monarchical government extending back to the mid 17th century. However, though Saskatchewan has a separate government headed by the Queen, as a province, Saskatchewan is not itself a kingdom. Government House in Regina is owned by the sovereign only in her capacity as Queen in Right of Saskatchewan and is used both as an office and as an official event location by the lieutenant governor, the sovereign, and other members of the Canadian Royal Family. The viceroy resides in a separate home provided by the provincial Crown and the Queen and her relations reside at a hotel when in Saskatchewan. Associations also exist between the Crown and many private organizations within the province; these may have been founded by a Royal Charter, received a royal prefix, and/or been honoured with the patronage of a member of the Royal Family. Examples include the Globe Theatre, which is under the patronage of Prince Edward, Earl of Wessex, and the Royal Saskatchewan Museum, which received its royal prefix from Queen Elizabeth II in 1993. 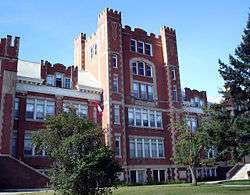 At the various levels of education within Saskatchewan, there also exist a number of scholarships and academic awards either established by or named for members of the Royal Family, such as the Queen Elizabeth II Scholarship in Parliamentary Studies and the Queen Elizabeth II Centennial Aboriginal Scholarship. In 1882, Princess Louise, Duchess of Argyll, and her husband, the then Governor General of Canada, were the first members of the Royal Family to pass through what would become Saskatchewan. During a stop at the not yet named territorial capital, in the dining room of the Royal Train, Princess Louise named the new community Regina, after her mother, Queen Victoria. Princess Margaret, Countess of Snowdon, presided over the celebrations of the 75th anniversary of Saskatchewan's entry into Confederation and Princess Anne marked Regina's centennial. 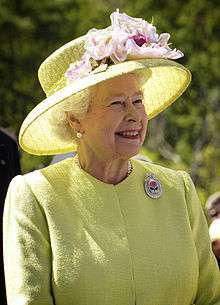 Queen Elizabeth II presided over the main events in 2005 celebrating the 100th anniversary of Saskatchewan's creation. ↑ Princess Anne, Princess Royal, for instance, was awarded her first Canadian honorary degree by the University of Regina in 2004, for her charitable work, and the University of Saskatchewan granted six degrees on viceroys between 1955 and 2006. ↑ Prince Charles, Prince of Wales, and Prince Edward, Earl of Wessex, were both inducted into Saskatchewan Order of Merit (in 2001 and 2005, respectively) and both the Earl of Wessex and his wife, Sophie, Countess of Wessex, were in 2005 awarded the Commemorative Medal for the Centennial of Saskatchewan. 1 2 3 Edward VII (20 July 1905). Saskatchewan Act. 10. Westminster: King's Printer. Retrieved 16 June 2009. ↑ Elizabeth II (17 May 2007). The Crown Minerals Amendment Act, 2007 (PDF). 1.a. Regina: Queen's Printer for Saskatchewan. Retrieved 29 June 2009. ↑ Elizabeth II (21 March 2002). Claim Settlements (Alberta and Saskatchewan) Implementation Act. 6.1.a. Ottawa: Queen's Printer for Canada. Retrieved 29 June 2009. ↑ Elizabeth II (30 March 1993). Saskatchewan Treaty Land Entitlement Act. Preamble. Regina: Queen's Printer for Saskatchewan. Retrieved 29 June 2009. 1 2 3 MacLeod, Kevin S. (2008). A Crown of Maples (PDF) (1 ed.). Ottawa: Queen's Printer for Canada. p. 16. ISBN 978-0-662-46012-1. ↑ Cox, Noel (September 2002). "Black v Chrétien: Suing a Minister of the Crown for Abuse of Power, Misfeasance in Public Office and Negligence". Murdoch University Electronic Journal of Law. Perth: Murdoch University. 9 (3): 12. Retrieved 17 May 2009. ↑ Privy Council Office (2008). Accountable Government: A Guide for Ministers and Ministers of State – 2008. Ottawa: Queen's Printer for Canada. p. 49. ISBN 978-1-100-11096-7. Archived from the original on 10 March 2010. Retrieved 17 May 2009. ↑ Roberts, Edward (2009). "Ensuring Constitutional Wisdom During Unconventional Times" (PDF). Canadian Parliamentary Review. Ottawa: Commonwealth Parliamentary Association. 23 (1): 15. Retrieved 21 May 2009. ↑ Forsey, Eugene (31 December 1974). "Crown and Cabinet". In Forsey, Eugene. Freedom and Order: Collected Essays. Toronto: McClelland & Stewart Ltd. ISBN 978-0-7710-9773-7. ↑ Swaan, Michael; Asfada, Solomon. "University Library > Robert N. Hurley: Skypainter > The Hurley Collection". University of Saskatchewan. Retrieved 29 June 2009. ↑ "Catherine Perehudoff". The Gallery/art placement inc. Retrieved 29 June 2009. ↑ "City Hall > History > History and Folklore Summary 1940 – 1949". City of Yorkton. Retrieved 29 June 2009. ↑ "University of Saskatchewan Archives > University History > Honorary degree recipients". University of Saskatchewan. Retrieved 29 June 2009. ↑ Government of Saskatchewan. "Publications Centre > Forms > Advanced Education, Employment and Labour > Queen Elizabeth II Scholarship". Queen's Printer for Canada. Retrieved 29 June 2009. ↑ Office of the Provincial Secretary. 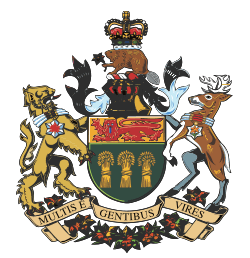 "About OPS > Protocol Office > Emblems of Saskatchewan > Coat of Arms". Queen's Printer for Saskatchewan. Retrieved 17 February 2011. 1 2 Archer, John H. (1996). "Regina: A Royal City". Monarchy Canada Magazine. Toronto: Monarchist League of Canada. Spring 1996. Retrieved 30 June 2009. ↑ "Royal couple touches down in Saskatchewan". CTV. 18 May 2005. Retrieved 30 June 2009. Barnhart, Gordon (2004). "The Queen in Saskatchewan". Canadian Parliamentary Review. Ottawa: Commonwealth Parliamentary Association. 10 (4): 14–15. Retrieved 1 July 2009. Jackson, Michael D. (1990). The Canadian Monarchy in Saskatchewan (2 ed.). Regina: Queen's Printer for Saskatchewan. Archer, John H. (1998). "Regina: A Royal City". Monarchy Canada Magazine. Toronto: Monarchist League of Canada. Summer 1998. Office of the Provincial Secretary. "About OPS > Protocol Office > Royal Visits". Queen's Printer for Saskatchewan. Ross, Matt (7 July 2003). "Award Winner Receives Royal Treatment". Saskatchewan Sage. "Prince of Wales Becomes a Cowboy". Saskatoon Star Phoenix. 12 September 1919. pp. 1 & 6. "Significance of Treaties Reaffirmed Through Historic Royal Visit". Saskatchewan Indian. Saskatoon: Federation of Saskatchewan Indian Nations. 30 (3): 3. 2001. "Society > The Monarchy > Caribou slippers for Prince Charles". CBC. 26 October 1951.